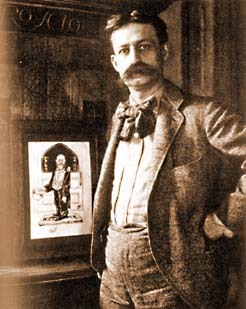 W. W. Denslow was a colorful figure at the turn of the century; described by his contemporaries as a large man with a walrus moustache and a foghorn for a voice. But before his work with Baum catapulted him into greater worldwide fame, he worked with the Roycrofters in East Aurora, providing many cartoons of humor and social commentary to the Philistine magazine. His trademark signature included a stylized rendering of a seahorse, shown here on the right side of the cartoon. 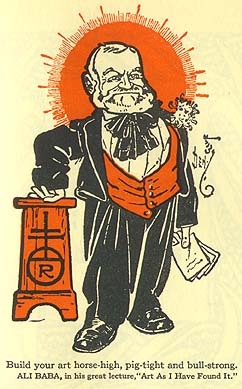 Elbert Hubbard, founder and guiding force of the Roycrofters, was quite fond of this figure and used it often, eventually adapting it to many Roycroft logos, including the cover of the Philistine magazine itself, and watermarks in the paper for many Roycroft books. Denslow also reproduced this image in the form of two massive seahorse fireplace andirons for the Roycrofters — extremely rare pieces which have sold at auction in excess of $12,000. 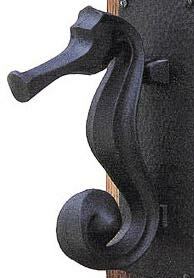 Dard Hunter obtained two large cast door knockers in this same design, also cast by the Roycrofters, and later installed one on the front door of the Gomez Mill House, site of his first paper mill, where it still resides. The other door knocker had never been used and was later found among the archives of the Mountain House. These are the only two castings known to exist. 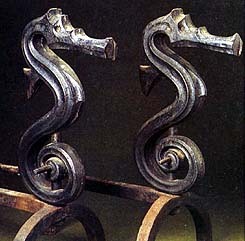 We have carefully reproduced our Seahorse Door Knocker from that unique original piece, faithful in every detail. — Denslow, by the way, flush with the riches of his “Wizard of Oz” fame, bought an island off Bermuda, held court as “Denslow the First” and lived happily ever after!